(Central Islip, N.Y., Sept. 29, 2018) – It would have been easy for the pressure to be too much for Dennis O’Grady. 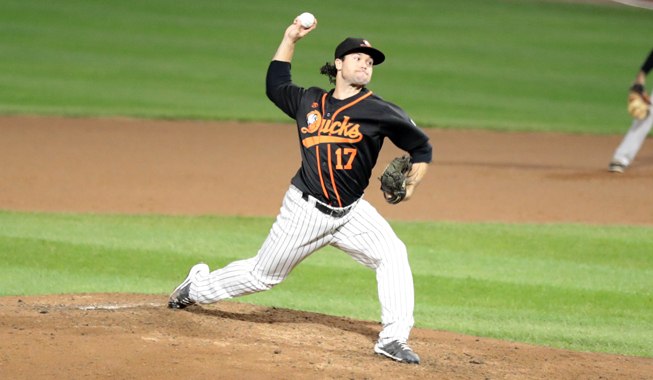 The 29-year-old Long Island Ducks righty was tasked with taking the ball for Game 4 by manager Kevin Baez, an outing that the Floral Park native would be making in front of a large contingent of family and friends at Bethpage Ballpark. Lose? Lose was not an option. Pressure was not an option. Seven innings of two-run ball in a big 6-3 win on Saturday night later, and it’s quite clear that what would be pressure for some was clearly motivation for O’Grady. It certainly didn’t hurt. Perhaps of more significance, however, was O’Grady having been in a very similar situation just last week. The former Padres farmhand got the Game 5 start against the Somerset Patriots in the Liberty Division Championship Series, and gained valuable experience in a win-or-go-home contest that he was able to use on Saturday night. “He’s a big game pitcher, the moment’s not too big for him,” Baez said. Lately for Long Island, that mantra has carried over to the whole team, with an incredible resiliency to come back from being down 2-0 to the Skeeters to force a fifth and deciding game on Sunday. “It’s almost pretty self-explanatory with going down to Sugar Land, losing that tough one, getting beat pretty good in the second one and then coming back here and ‘Wash’ with that big home run down 2-1 in the eighth…you win that game, and it shows that you’re really a resilient squad and that we’re going to play until the last out,” O’Grady said. More of the same from the Ducks, who have made a habit of late-game comebacks all season long.